Learn how to make Belle’s Favorite Salad in the video above. Wedge salads are in all the restaurants and I love the textures and flavors of these unique looking salads. However, they make you to all the hard work. That big chunk of iceberg lettuce is really a pain to cut up and eat. When I make my version, I do the chopping and mixing before I serve it and I think everyone appreciates that. This salad tosses together lettuce, sweet apples, ripe tomatoes, and a savory twist of bacon and blue cheese. It is lightly coated with a creamy poppy seed dressing, and then topped with the sweet and salty crunch of glazed pecans. My favorite salad is a mainstay at my house and a family secret I should keep, but of course, I won’t. 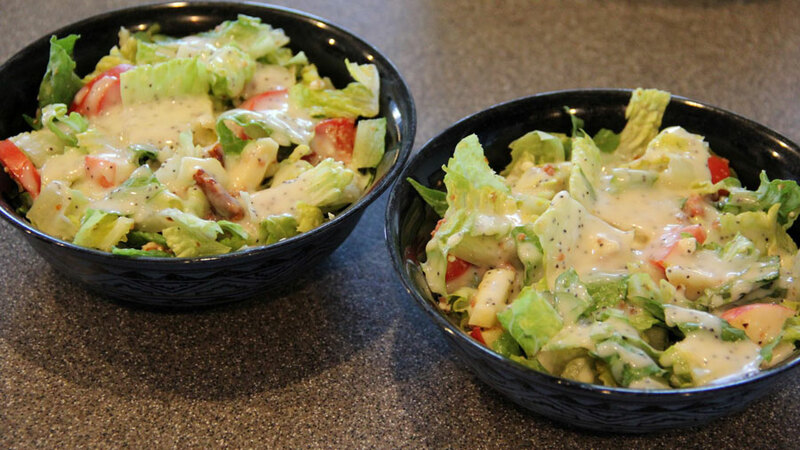 I’ll divulge the mystery and give you the recipe for a salad your family will love. Toss all ingredients together and drizzle with the dressing below. Whisk together all ingredients and drizzle over salad.